Hotel Catalonia Rigoletto, Barcelona. Catalonia Rigoletto Hotel Barcelona. 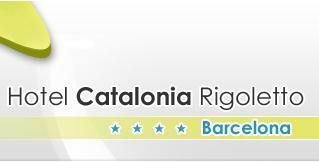 The hotel Catalonia Rigoletto is found in the centre of Barcelona near the main commercial and financial area of the city, close to the new Clinic Dexeus, the Nou Camp (Barcelona's Football Club stadium) and connected to the historical center of Barcelona. The hotel offers services such as laundry and dry cleaning and can help guests arrange a car hire if necessary offering special rates. The hotel prepares a lovely buffet breakfast and has its own restaurant that serves Mediterranean style cuisine in a comfortable setting. The bar area is open from 10:00 am to 23:00 for those looking for a quiet place to relax and un wind with a coffee or a drink. The comfortable accommodations offer services such as: heating/air-conditioning, direct phone line, mini-bar, safe, complete marble bathroom with hairdryer, telephone and increasing mirror, plasma screen TV with International channels.